Wardrobe, Hairstyle and Real Style Tips: How to Watch Bravo’s "The Fashion Show" | Fashion. Style. Beauty. | Life is short. Live well. Wardrobe, Hairstyle and Real Style Tips: How to Watch Bravo’s "The Fashion Show"
I decided I wanted to wait a couple of episodes to review Bravo’s new fashion reality show, The Fashion Show to make sure that if I did decide to watch and review the show, it’s because I truly thought it was worth watching and reviewing. After Episode 3, I’m now hooked. Isaac’s comments are fabulous (as always), Fern Mallis is genius and Kelly Rowland…well, I still can’t figure that whole thing out exactly but I’m staying with it. In any case, this is my personal guide on how to get the most out of watching The Fashion Show. Wardrobe tips – If you watch these shows with an eye for how the designers style their looks down the runway, they give you a perspective on what works and what doesn’t in regards to silhouette, fabric choice, fit and construction. It’s easy to armchair quarterback something that looks awful on television but if you don’t immediately go back to your own closet to make sure that you immediately set fire to an article of your own wardrobe that might be doing the same to you, you’re missing an opportunity here. We all have something in our closets that do this, people. Have a glass of wine after every episode and cross your fingers that awful jacket isn’t sitting in your own closet. Hairstyling tips – TresSemme is a genius haircare line and the looks that Jeanie Syfu and her team send down the runway are completely translatable to every day life. Pay attention to the hair: it’s always well-styled but never so elaborate or complex that it distracts from the clothes, which means that it’s usually easy to replicate the look. Exhibit A is the hair on the winning garment, a simple but chic ponytail: run TresSemme 24 Hour Body Sculpting Spray Gel through your wet hair, blow it dry using a paddle brush, then tie it into a pony at the crown. Create quick waves in the ponytail with a 1″ curling iron and finish it off with TresSemme 24 Hour Body Finishing Spray. Runway ready in no time flat. Real-life takeaways – This week’s Harper’s Bazaar challenge was for the teams to perform basic repair to a jacket and a skirt in a very short amount of time. Think this is unreasonable? What happens if you have a button come off, your hem fall our or the lining of your jacket rips before a big presentation? Even mere mortals should know how to sew. Those Harper’s Bazaar challenges have more real-life application than you think. Last week’s challenge where they had to decide what was designer and what was fake? Watch and learn, people. 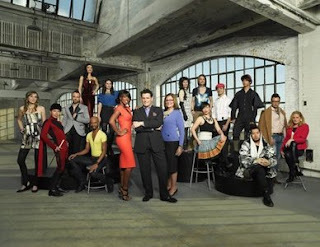 Of course, the fun – Look, we all know how much I adore Isaac Mizrahi and his comments are hilarious (calling the exaggerated hips on Haven’s coat reminiscent of the Seattle Space Needle is classic Isaac) but we all watch reality competition for the hilarity of the personalities, the drama and the sheer talent on display. Who will win is really anyone’s guess at this point (my money is on James-Paul) but if you make these shows work for you, you can actually walk away a more savvy fashionista. That being said, I’ll keep you posted moving forward but overall I’m in. I will be showing up weekly for The Fashion Show.